Turkey cannot accept the final statement from a European Council meeting calling on Ankara to end "illegal actions" around Cyprus, just days before Turkey and the EU are scheduled to hold talks in the Bulgarian city of Varna, Minister for EU Affairs and Chief Negotiator Ömer Çelik said Friday. President Erdoğan is scheduled to hold talks in Varna, Bulgaria with EU Council President Donald Tusk, Commission President Jean-Claude Juncker and Bulgarian Prime Minister Boyko Borissov on March 26 as part of the Turkey-EU summit. In a series of tweets, the minister said Turkey considered the Varna summit "an important opportunity to move our relations forward" and would go there "with a sincere, well-intentioned and constructive understanding." 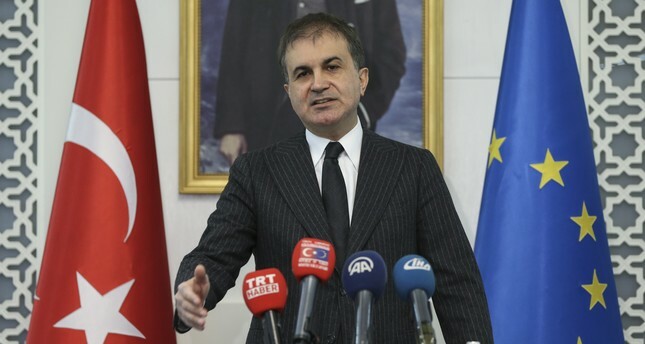 "We expect the same positive and constructive approach from the EU," Çelik said. However, he also said it was 'unfortunate' that the same EU officials who said "the Greek Cypriots and Greeks were responsible for the failure of the Crans Montana talks for a Cyprus solution" had made such a statement. In parallel with Çelik's comments, Foreign Ministry Spokesperson Hami Aksoy also said Friday that "The EU has completely lost its objectivity on the matter of Cyprus. If this attitude continues, it is impossible to accept the EU as a third party on the Cyprus issue." Stressing that the EU must show a "more constructive stance" to build trust in relations, Aksoy said Turkey expects to "revitalize" relations with the block following the summit. Updating the Customs Union agreement, visa-free travel for Turkish nationals, and expediting the transfer of funds for Syrian refugees are expected to be discussed at the summit, he added. On Turkey's push for the extradition of Salih Muslum, former co-leader of the PYD/PKK terrorist group, he called on EU countries not to be a "hypocritical" and "fulfill our requests." The officials' comments come after European Union leaders condemned Turkey's efforts to stop natural gas exploration off Cyprus ahead of the EU-Turkey Summit. In a draft statement, EU leaders called on Turkey "to cease these actions and respect the sovereign rights of Cyprus to explore and exploit its natural resources in accordance with EU and international law." Last month, Turkish warships blocked a rig from reaching an area southeast of Cyprus where Italian company Eni was to drill. Ankara said it would prevent any further drilling off Cyprus without the direct involvement of the ethnically divided island's Turkish Cypriots. Greek Cyprus has been trying to exclude Turkish Republic of Northern Cyprus (TRNC) and Turkey, which has been conducting seismic surveys in the area and exercising its legal rights in accordance with international maritime law. The government in the south of the island last month commissioned Italian energy company ENI, which declared the discovery of a potentially sizable gas field off the southwestern coast close to Egypt's Zohr deposit, which is the largest-ever discovered in the Mediterranean. However, Turkey immediately deployed warships to the region and prevented the Italian energy firm from continuing its operations in the region. As a result, ENI's drilling vessel left the area. The disregard for Turkish Cyprus's rights in the region did not stop with the ENI vessel. Following the Turkish Navy's blockade of ENI, early in March, vessels from U.S. oil giant ExxonMobil and state-owned Qatar Petroleum consortium were reported to have arrived in the Eastern Mediterranean to conduct offshore drilling activities. The island of Cyprus has been divided since 1974 when a Greek Cypriot coup took place after decades of violence against the island's Turkish community and Ankara's intervention as a guarantor power. It has seen an on-and-off peace process in recent years, including the latest initiative in Switzerland under the auspices of guarantor countries Turkey, Greece and the U.K. that collapsed in 2017.